Real men eat quiche and whatever else is put in front of them I say…This one ladies is sure to win the heart of any man…it’s meaty,it’s potato and it’s easy as “pie” or flan in this case. 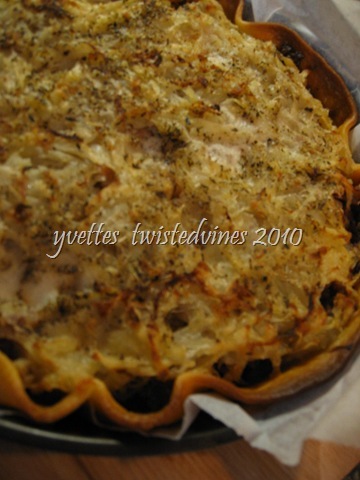 There’s a harmony of luscious taste and flavor in this filling, topped with potato and a covering of onion for a delicious mouthful every time.I also love the flan base of brisèe pastry.The texture is wonderful with every bite. Recipe: Sausage,sun dried tomato and potato flan. Leave the pastry sheet at room temperature. Pre heat oven 200°c. To make the filling, firstly slice the onions thinly, heat 2 tablespoons of olive oil in a non stick fry pan,add grated garlic and cook the onions,stirring continuously.Add 3 tablespoons of water, cover and cook for about an hour on a low flame.Place a side to cool. Note: For a more rapid method the onions can be cooked in a microwave.Place in bowl and cover with plastic wrap, cook on high for 10 minutes. 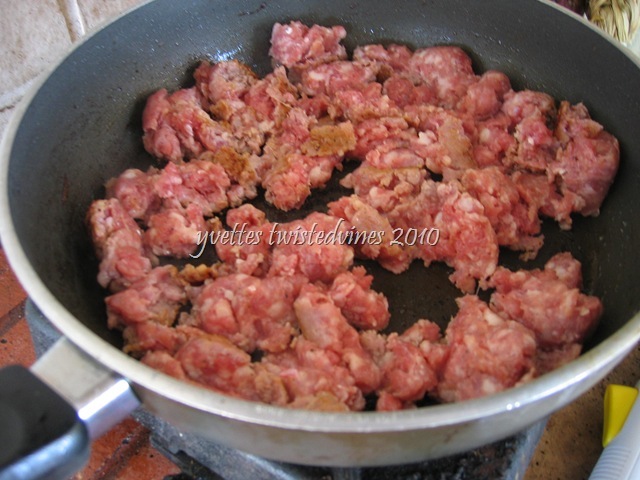 In a non stick fry pan,remove the outer skins of the sausages and place in pan. Cook until brown, skim off any excess fatty juices. 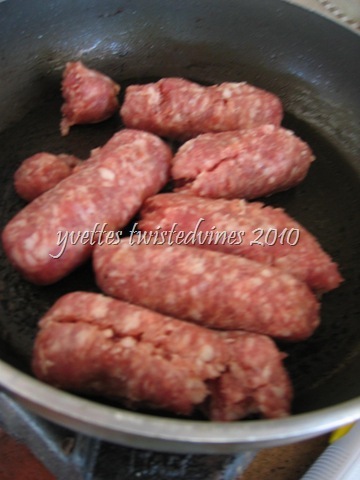 Cooking time here about 10 minutes…add a tablespoon of flour, and stir. 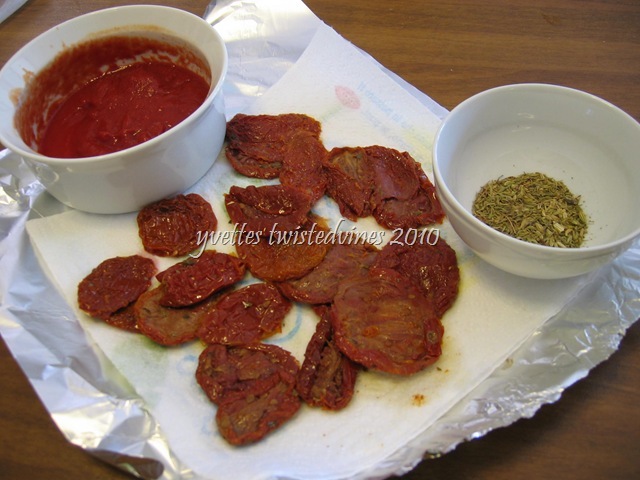 Add the sun dried tomatoes( I used sun dried tomatoes under oil, however I placed them on paper towel to drain off excess oil) dried herbs and tomato paste. 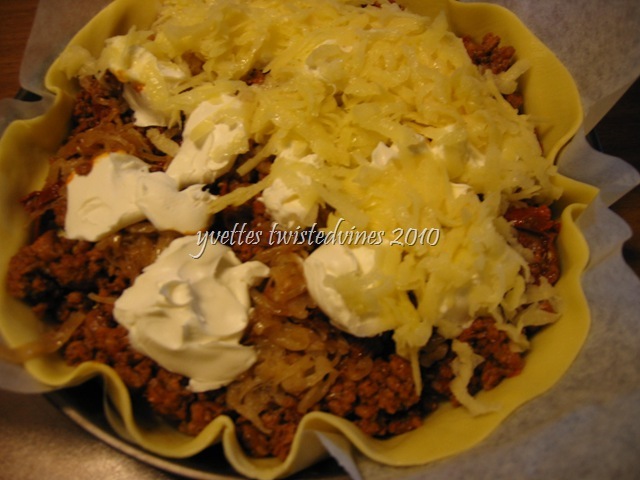 Cook for about 5 minutes and place in pastry case,with a sheet of oven proof paper underneath the pastry.